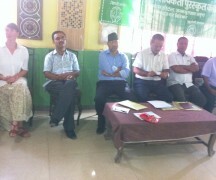 Participants of Social Dialogue Group formed in Masuriya VDC of Kailali participating first dialogue meeting "Sharing of Childhood Stories"
H. E. Matthias Meyer, German Ambassador to Nepal and Executive Director Mr. Prakash Mani Sharma in the national level interaction programme. Pro Public Youth Wing Activities Pro Public Youth Wing has been actively involved in various activities. Following are the recent activities carried out by the Youth Wing of Pro Public.